I've had this film for quite a while, but for some reason couldn't bring myself to watch it. Why is that, you ask? Because it's about a dog and a dolphin that are in love. It's 1997's Zeus and Roxanne. Steve plays Terry, a single father Terry Barnett and owner of Zeus, troublemaking and dolphin-loving dog. In his family films, Steve's very good at being an either bad or neglectful single dad. In this one, he's more neglectful. He's an earring wearing musician who lets his 9 year old son take care of him. This kid prepares all the meals, does all the cleaning, takes care of the dolphin-loving dog. This is the slave child that every parent hopes for. Kathleen Quinlan plays Mary-Beth, the romantic interest and next door neighbour. Clearly, after her award winning role as Tom Hank's wife in Apollo 13, playing the love interest in a Steve Guttenberg family film was the next logical step. She's also the matchmaker for Zeus, the dog, and Roxanne, the dolphin. She realizes that they can communicate with each other and tries to get some research grant about interspecies comunication. Majandra Delfino plays one of Mary-Beth's kids and it drove me crazy for about half the movie trying to figure out how I knew her. Then it finally hit me that she was Maria on Roswell. And no, I will not be embarassed for watching Roswell. You cannot shame me with your judging! She has possibly the best line of a movie: "If a dolphin and a dog can get along, why can't our mom and his dad?" Yes. Why can't we all just get along? 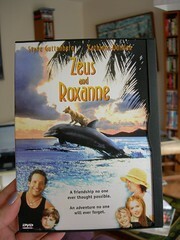 Anyway, I would say that if you are a fan of kids, dogs and/or dolphins then this might just be the movie for you. And if you are a fan of late nineties shirtless Guttenberg, this is definitely the movie for you. Shirtless, an earring AND a motorcycle. He's the bad-boy single dad you've always dreamed of, isn't he?